On the morning of October 17, 1781, the British army in Yorktown, Virginia, surrounded by the joint American-French army, waved the white flag of defeat. Negotiations for the British surrender commenced that day. The following day, October 18, Alexander Hamilton wrote to his wife, “Tomorrow Cornwallis and his army are ours. 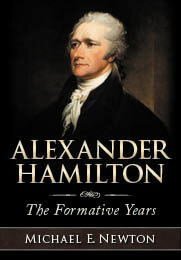 In two days after I shall in all probability set out for Albany, and I hope to embrace you in three weeks from this time.” If Hamilton stuck to this schedule, he would have left Yorktown on October 21 and planned to be in Albany around November 9. Certainly by October 27, Hamilton had left Yorktown, as George Washington reported to Philip Schuyler. 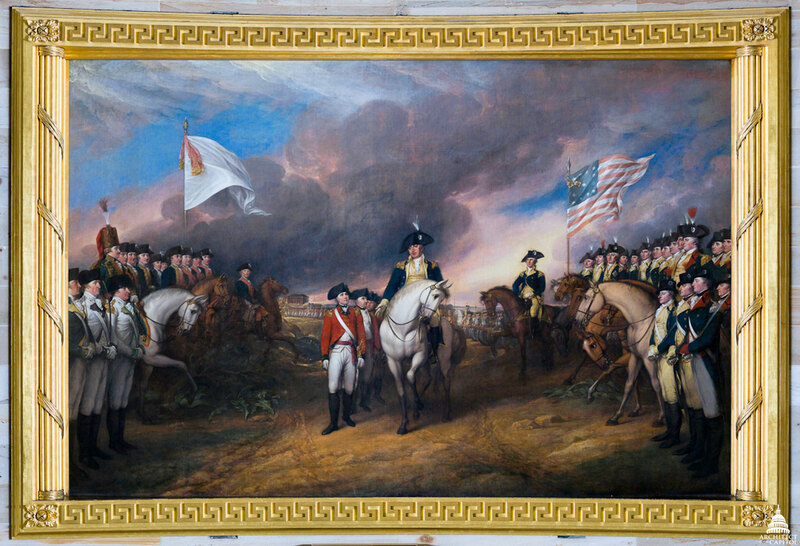 Surrender of Lord Cornwallis, by John Trumbull, in the Rotunda of the US Capitol, courtesy of Architect of the Capitol. Alexander Hamilton can be seen to the very right standing next to the white horse. Little had previously been known regarding Hamilton’s route and timeline from Yorktown to Albany. On December 6, Philip Schuyler reported to James Duane that Hamilton, “absent from his wife for some time, . . . thought of nothing but reaching her the soonest possible, and indeed he tired his horses to accomplish it and was obliged to hire others to come on from Red Hook.” This establishes that Hamilton had reached Albany by December 6 and that his travels took him through Red Hook, New York, a town about 50 miles south of Albany. The above is all that can be found in the various Hamilton biographies regarding this journey. There is no mention of Hamilton’s route from Yorktown to Red Hook. No one writes about when Hamilton reached Red Hook or Albany. Since publication of Alexander Hamilton: The Formative Years, I have found two more pieces of the puzzle, both of which were found in the Public Papers of George Clinton, published in 1899–1914. For decades, these two scraps of information had gone unnoticed by Hamilton biographers. Robert R. Livingston, attributed to Gilbert Stuart, courtesy of Wikimedia. It is clear from the contents of this letter that Hamilton was with Livingston when he wrote it. 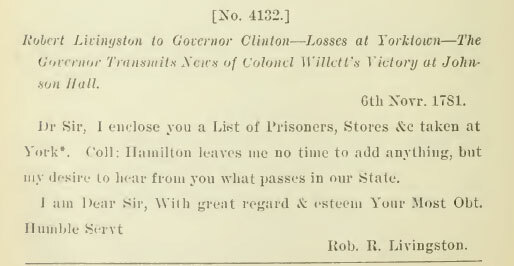 In fact, based on the letter presented below, it would appear that Livingston gave this letter to Hamilton to deliver to Clinton. Although the letter as published does not give their location, a quick look through other sources reveals that Livingston was in Philadelphia at this time. Thus, Hamilton was in Philadelphia on November 6, 1781. The above letter also makes it clear that Hamilton was in a rush to continue northward. 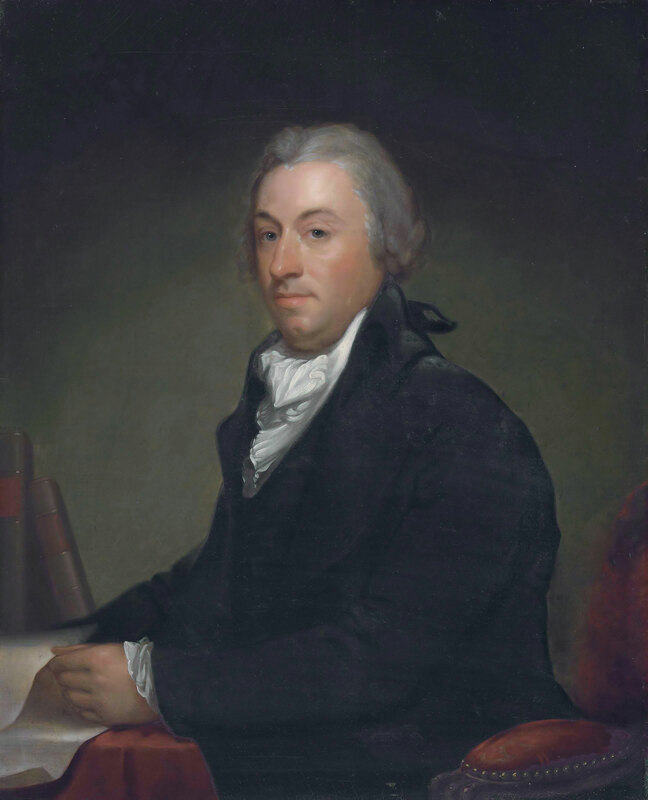 Likewise, Hamilton later apologized to Richard Kidder Meade for having “neglected to prepare what I promised you at Philadelphia. The truth is, I was in such a hurry to get home that I could think of nothing else.” According to this, it would seem that Hamilton did not stay long in Philadelphia. One therefore must assume that Hamilton arrived in Philadelphia on November 6 or perhaps a day or two earlier and then departed the city on November 6 to continue his journey northward. 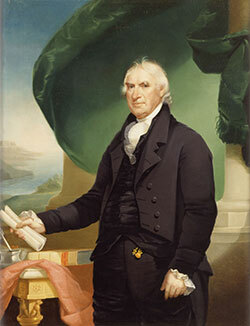 George Clinton, by Ezra Ames, courtesy of Wikimedia. 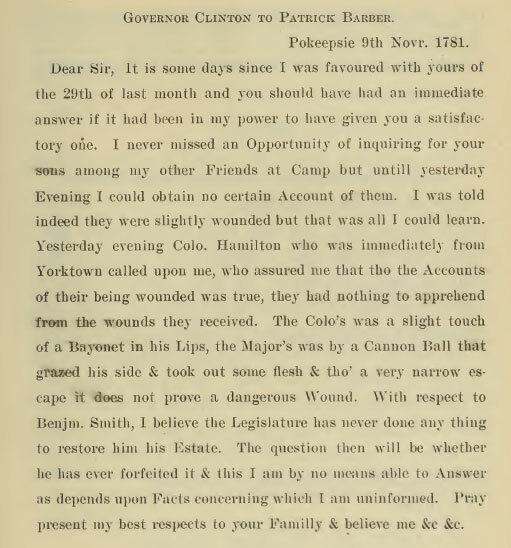 Thus, according to this letter, Alexander Hamilton had been in Poughkeepsie the evening of November 8, 1781. It is now clear that Alexander Hamilton traveled from Yorktown to Philadelphia to Poughkeepsie to Red Hook and finally to Albany. His exact route between these cities remains unknown. From Philadelphia, the timeline and route is much clearer. Hamilton presumably left Philadelphia on November 6 and arrived in Poughkeepsie on the evening of November 8, traveling the 150 miles in just three days. From Poughkeepsie, Hamilton rode through Red Hook, where he had to hire new horses, and then continued on to Albany. Depending on when Hamilton left Poughkeepsie and how long it took him to get new horses in Red Hook, he should have reached Albany around November 11, about two days later than he had predicted before he set out from Yorktown. All this hard riding to reach his wife in Albany left Hamilton in a miserable condition. On December 29, 1781, he wrote to Nicholas Fish, “I have been very sick—I am still alternately in and out of bed. How are you after your Southern fatigues?” This again suggests that Hamilton had traveled as quickly as possible from Philadelphia to Poughkeepsie to Red Hook to Albany, and perhaps had also traveled as fast as possible from Yorktown to Philadelphia, though his taking up to 16 days to make that journey raises some questions regarding that leg of the trip. Alexander Hamilton to Elizabeth Hamilton, October 18, 1781, in The Papers of Alexander Hamilton 2:683. George Washington to Philip Schuyler, October 27, 1781, in Founders Online. Philip Schuyler to James Duane, December 6, 1781, in The James Duane Papers [New-York Historical Society] Reel 2 (quoted in Mitchell, Alexander Hamilton: Youth to Maturity 261; Mitchell, Alexander Hamilton: The Revolutionary Years 283; Flexner, The Young Hamilton 369; Newton, Alexander Hamilton: The Formative Years 503). Robert R. Livingston to George Clinton, November 6, 1781, in Public Papers of George Clinton 7:486. Robert R. Livingston to Benjamin Franklin, November 2, 1781; Robert R. Livingston to John Adams, November 20, 1781. Alexander Hamilton to Richard Kidder Meade, March 1782, in The Papers of Alexander Hamilton 3:69–71. George Clinton to Patrick Barber, November 9, 1781, in Public Papers of George Clinton 7:459. Alexander Hamilton to Nicholas Fish, December 29, 1781, in The Papers of Alexander Hamilton 2:684. © Posted on April 30, 2018, by Michael E. Newton. Please cite this blog post when writing about these new discoveries.